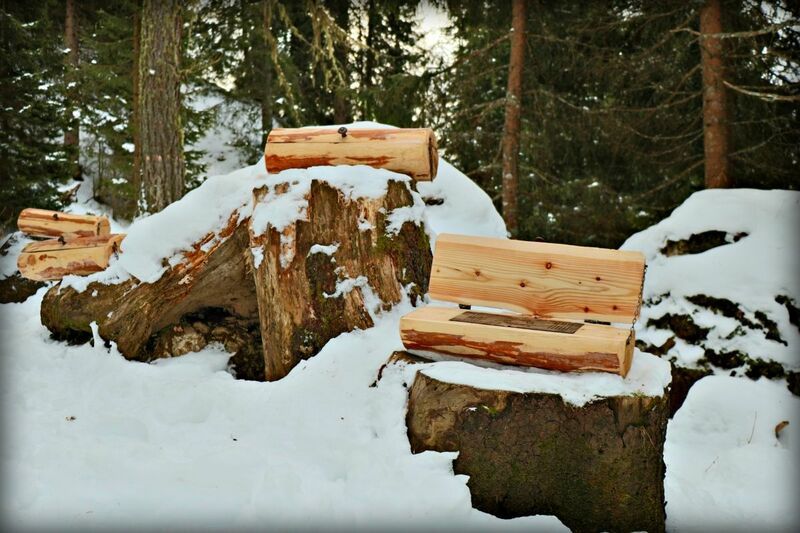 The Dragon Forest during winter is an easy walk in the mountains for children and families. It is a loop path 1,4 km long, flat and accessible to everyone: the snow is groomed by a snowmobile. You start and arrive in the same point: not far from the bubble car Predazzo-Gardonè. 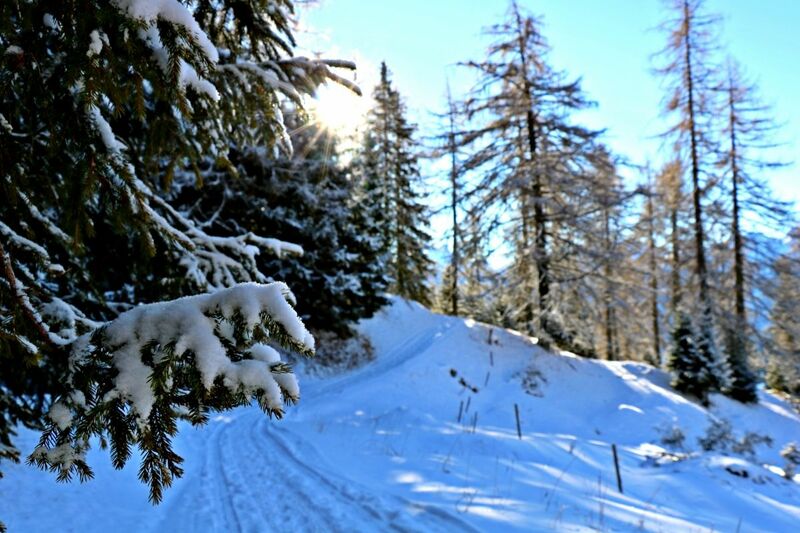 The children’s walk across the snow lasts approximately one hour, there is no need to be accompanied. The path unwinds partly through the woods, it is sunny and panoramic. 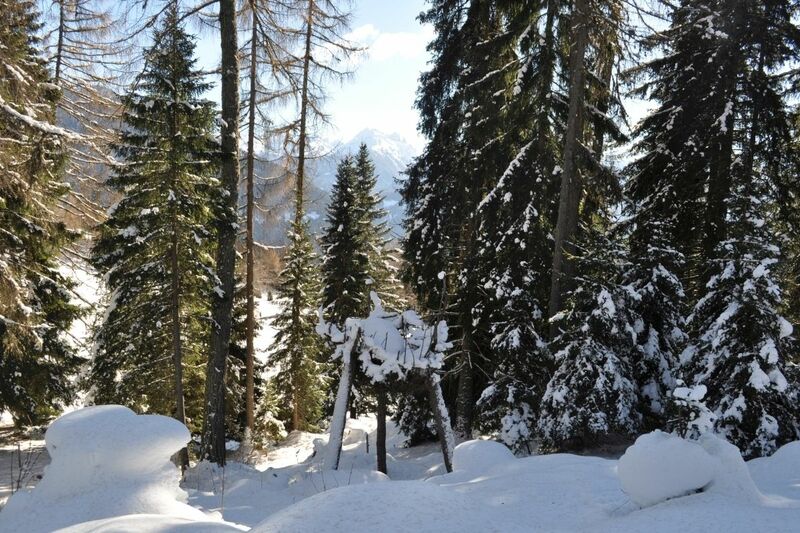 You are situated in the Ski Center Latemar Ski resort , at an altitude of 1650m on the Dolomites, UNESCO heritage site. Gardonè is in Trentino, 10 minutes from Predazzo, in Val di Fiemme. Look up and you will be able to admire the marvellous Latemar towers. The best way to discover the Dragon Forest in winter is by using a playbook: clues, riddles, short stories which develop your imagination. 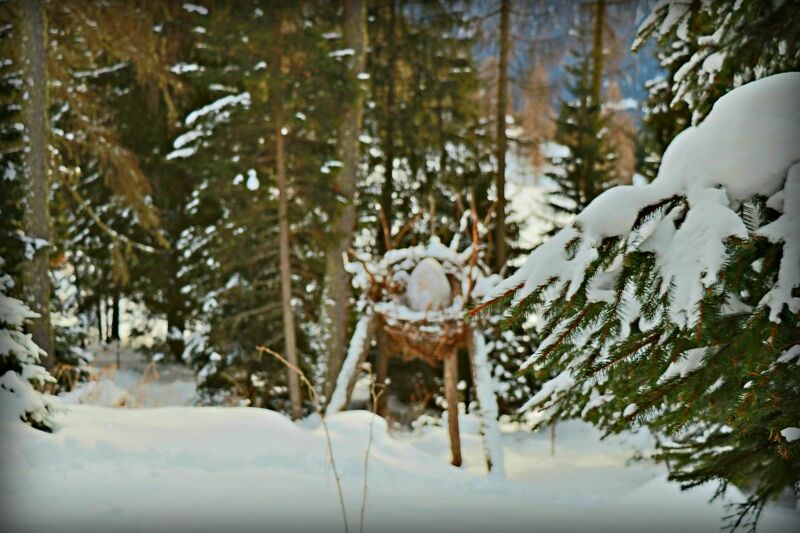 The Dragon Forest is a theme path for children and families, an easy walk through land art on the snow with your kids. The ring path in the Dragon’s Forest is closed momentarily. The terrible storm of last October 29 threw down some trees, fortunately saving the Dragon’s Nest and other game-installations. We are working to clear the path. We can go back for a walk in the Latemar fairy tale next summer. To get there use the Predazzo-Gardonè bubble car. 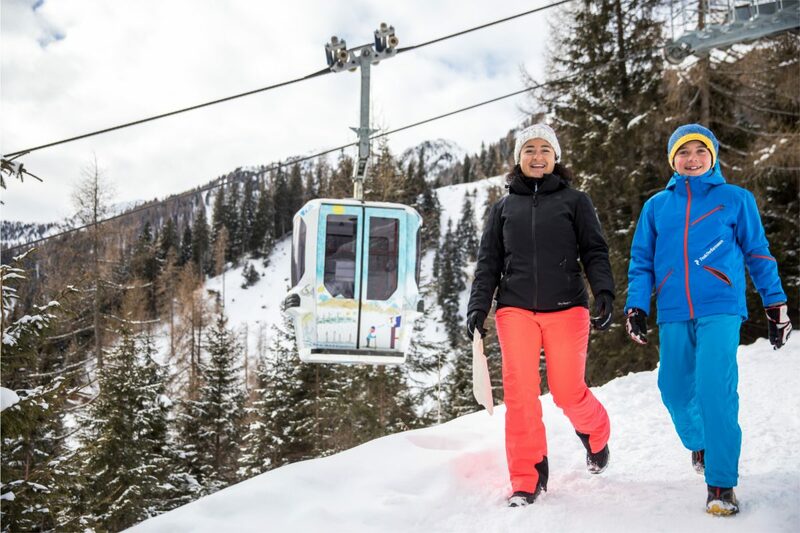 At the ski pass office, at the ticket office, you can ask for any kind of information. 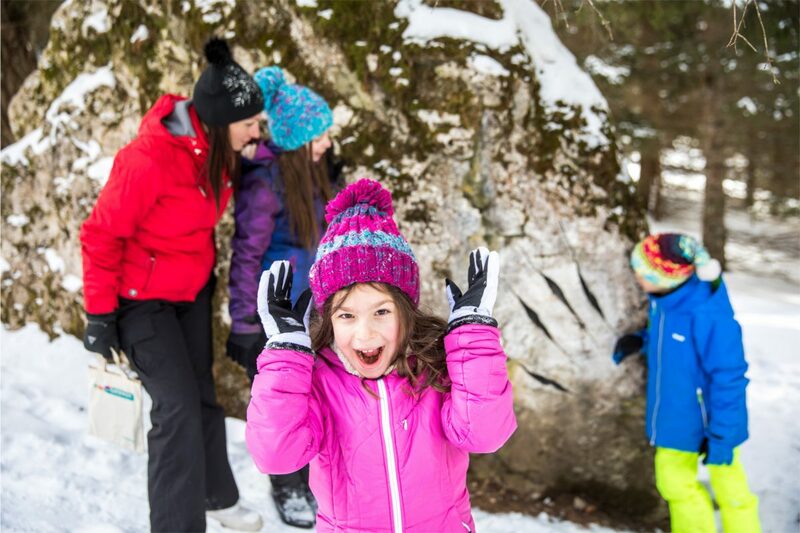 Anyone coming to Trentino during winter for a family holiday, will find great surprises in the mountains of Val di Fiemme. 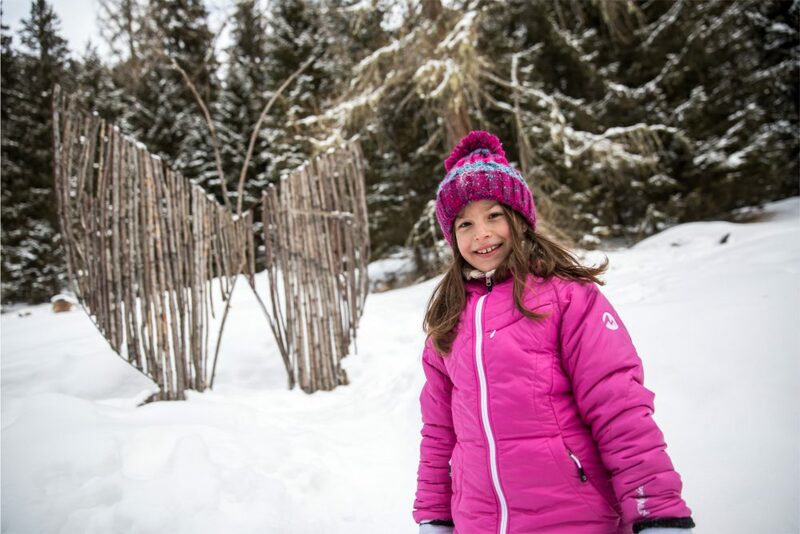 If you’re looking for an activity for your holiday with the kids, if you’re always up for some fun when it’s play time, if you’re looking for easy walks with the children during winter in Val di Fiemme you will find the Dragon Forest. 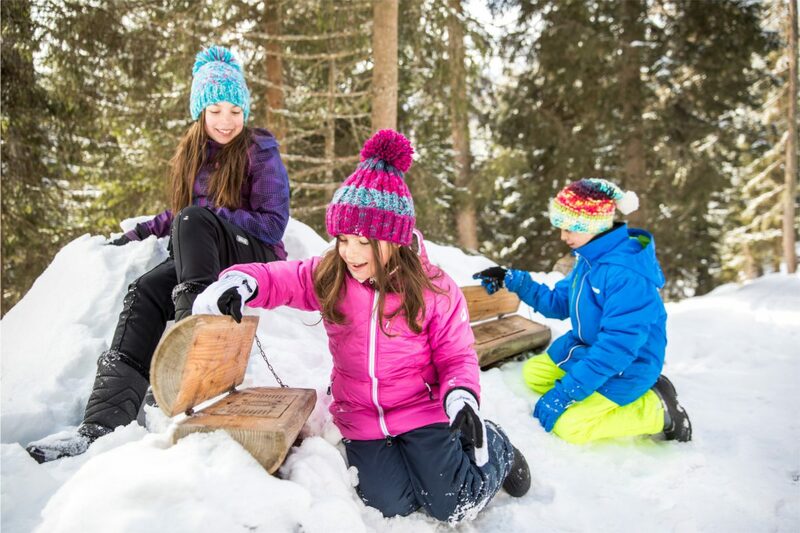 The Dragon Forest is an easy walk on the snow for children with family games. The loop path is flat, and made with land art, respecting the environment. We are in Trentino, below the Latemar mountains, in the UNESCO Dolomites. You don’t need a guide, you can take a walk on the snow and be inspired. That’s what mountain holidays with children are like: all it takes is a story which encourages the kids to look up and open their heart’s eye. 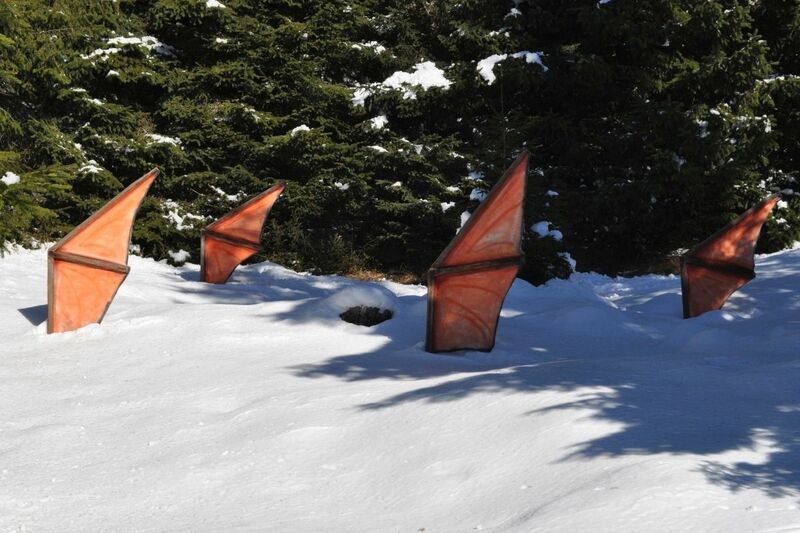 The installations along the path were made by local artists: local students from the school of Pozza di Fassa, Liceo Artistico G.Soraperra who worked with Marco Nones. Together they walked, looked at rocks, trees, meadows, and gave life to the Dragon Forest and with real master pieces of land art enhanced the territory and the Trentino Dolomites. 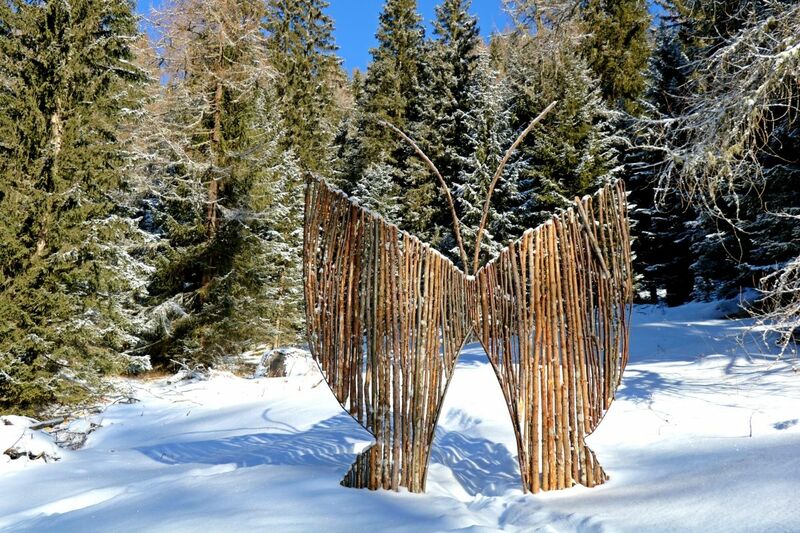 The land art is contemporary: the art work respects the environment, and is made with natural materials and is ephemeral. Wind, rain, snow, sun transforms it with the passing of time. To help you find the dragon footsteps there are playbooks: books full of riddles, drawings intelligence tests which will accompany you along the path. With the Findadragon Adventures children play and enjoy themselves. 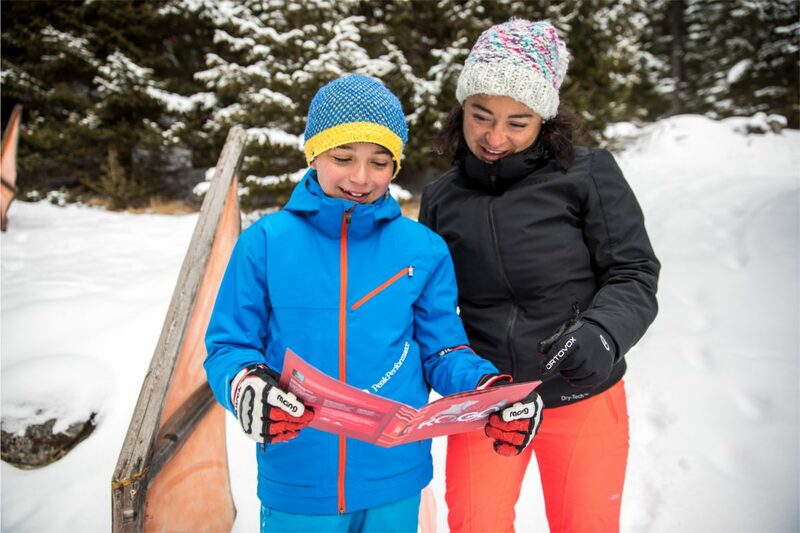 There are 2 playbooks (even in German and Italian), ideal for children of all ages: for young and older explorers learning to discover the mountains in winter. While you go for a walk with the children in the Dragon Forest turn the pages of your playbook, solve clues and at the end of the itinerary if you complete it, you will get a prize. Some of the prizes have been sculpted in wood by the local artisans, based on designs by the students of the LIceo Artistico G. Soraperra of Pozza di Fassa. 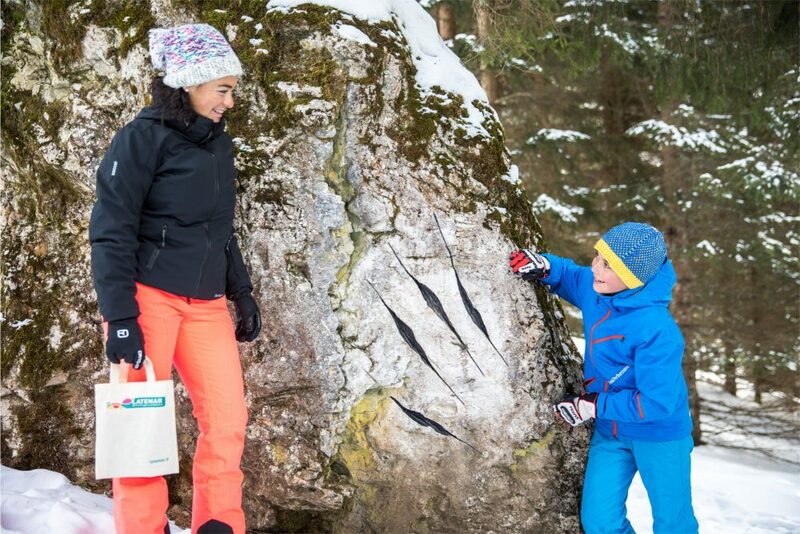 When you get off the bubble car at Gardone you can choose the play books and little souvenirs to take home from your family holiday in Val di Fiemme. Rogos is the dragon of volcanoes: flame red, nostalgic temperament. He cannot find his way around the lunar landscape of the Latemar, and is troubled. He spits out thick flames like lava across the mountains in an effort to recreate the sombre atmosphere of his volcanoes. Take heart, you have a mission to accomplish. But be careful of Kraus: a powerful magician always ready to pounce. When you find the rock of the prophecy you are on the right road. Rametal is the guardian of the Latemar mountains: a green copper colour with a protective spirit. He can detect the slightest movement within a range of 5 km will this be enough to protect his little inheritance from Kraus. Carry on with confidence, overcome the tests and solve the clues: Rametal will understand that he can trust you. Through hollow trees, fire and brimstone and precious, little remains and your mission will be accomplished. Rametal is the perfect playbook for curious children from 6 years up. 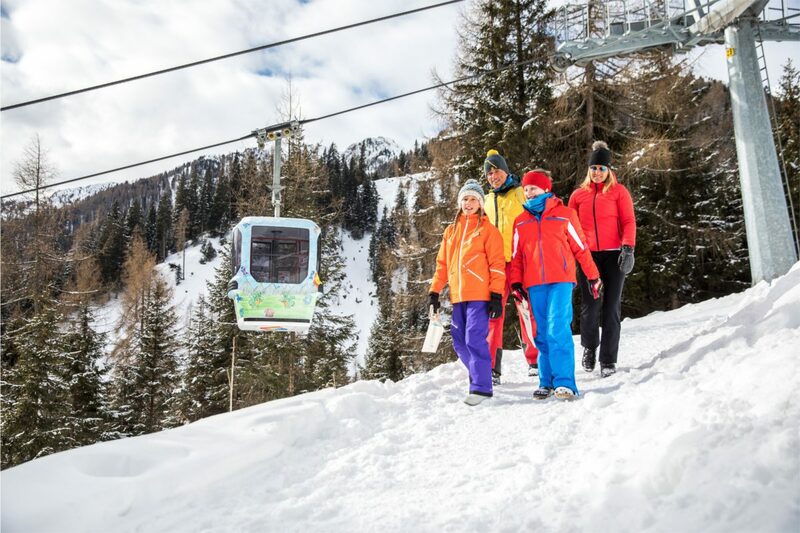 At Gardonè you can whizz at full speed on the Alpine Coaster Gardonè, enjoy yourself on the sledge run, laugh away and then stop off in the Kingdom of Dragons, an open air playground which is free.